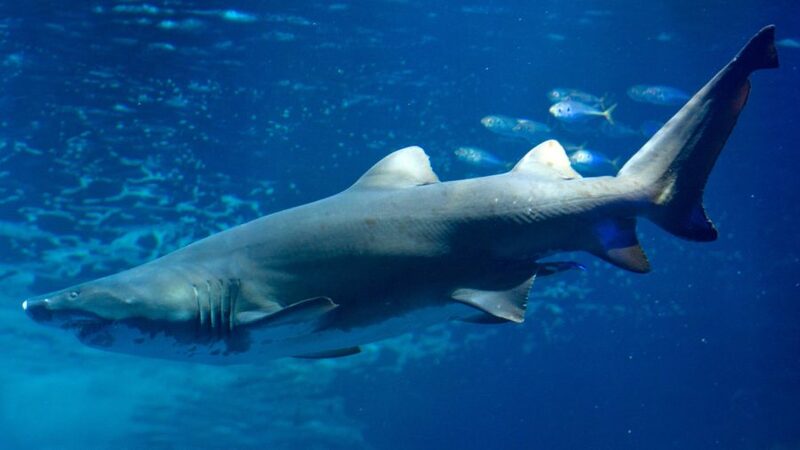 A large shark in Hawaii prevented fire rescue officers from recovering a body floating in the ocean off the coast of North Kohala, according to multiple reports. Hawaii County fire officials arrived at the scene just before 11 a.m. Sunday, April 7, after hikers in the area reported seeing a body floating facedown about 30 yards offshore from a steep cliff, reported Hawaii News Now. A helicopter from the Waiakea Rescue Station arrived on scene and observed what appeared to be a “large tiger shark circling the body,” fire officials said. Fire officials made attempts to recover the body using a Billy Pugh net on the helicopter, but it was unsuccessful because of the position of the body. Billy Pugh nets are a transfer device for lifting victims and rescuers by helicopter to safety. “In the process of putting a Fire Rescue Specialist in the Billy Pugh net to recover the body, a bystander reported that a shark had submerged the body and it was no longer visible,” the fire dispatch said in a news release, according to Hawaii News Now. The helicopter remained at the scene and continued to conduct an aerial search, but the body was not seen again, reported KITV. The search to recover the body was called off. Attempts to recover the body began around 11 a.m. and lasted until 3 p.m., according to Honolulu Star-Adviser. Hawaii County Police officers recovered a backpack and belongings they think belong to the victim at the top of the cliff, officials said. The victim’s name has not been released, “pending the notification of next of kin,” reported KITV. Tiger sharks are named after the dark striped pattern found on young tiger sharks that is similar to the coats of tigers. As skilled scavengers, tiger sharks have an exceptional sense of sight and smell and will eat most things, according to National Geographic. They are second only to great white sharks in attacking people. However, unlike great whites—which usually swim away after having tasted a human—tiger sharks are more deadly to humans because they will eat almost anything. Last September, a shark attacked a 23-year-old surfer at a Hawaii beach and bit his wrist and elbow, causing him to bleed profusely. “You kind of just saw blood everywhere,” Ryan Hailstones, another surfer, told KHON, adding that he was about 20 feet away from the attack. Shark warning signs have been posted in the area. Surfers brought the man to shore and made a makeshift tourniquet from their surfboard leashes, KHON reported. The Epoch Times reporter Jack Phillips contributed to this article.